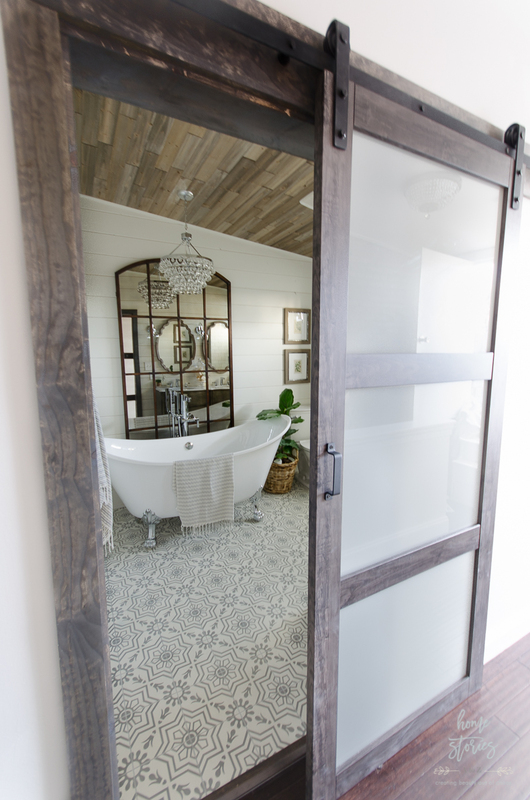 Barn doors and sliding doors are wonderful space-saving options that add instant charm and character to your home! 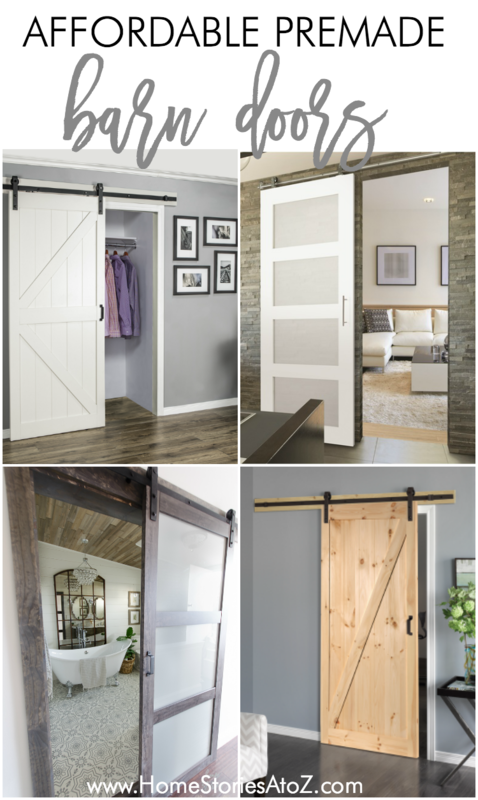 I recently highlighted 20 DIY Barn Door Tutorials to build yourself in case you’re interested in creating your own barn door. 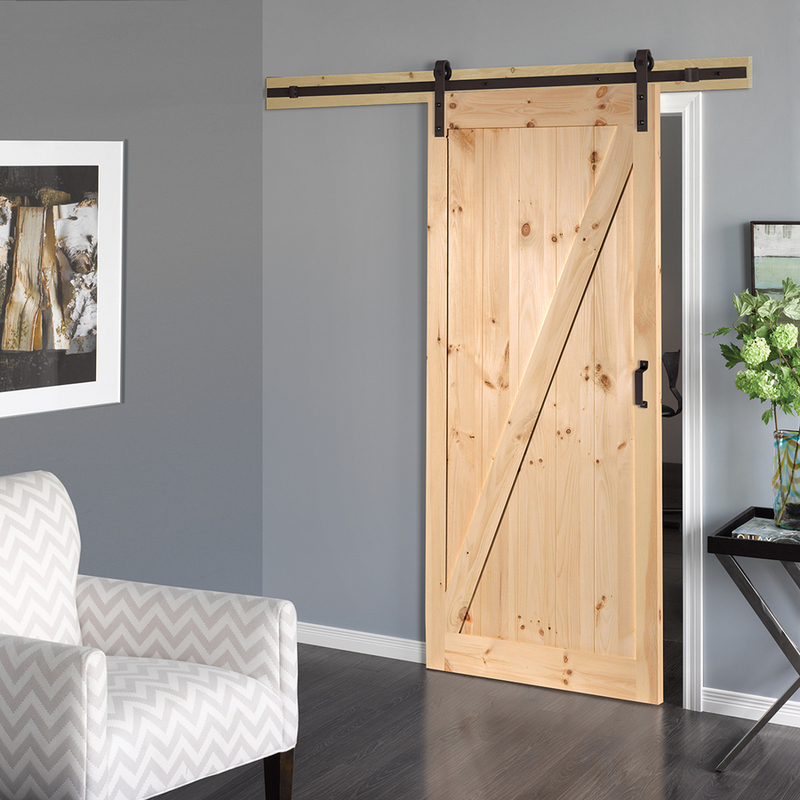 But what if you just want an affordable premade barn door that is ready to install? I’ve got you covered on that front as well! 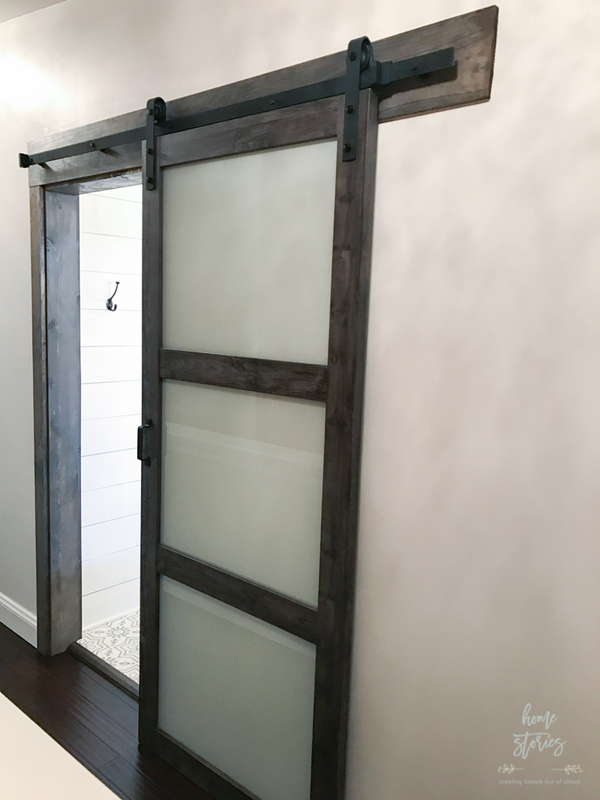 If you’ve looked into premade barn doors online, then you already know they tend to be pricey. The hardware alone can cost several hundred dollars and many premade doors retail for over $1000. 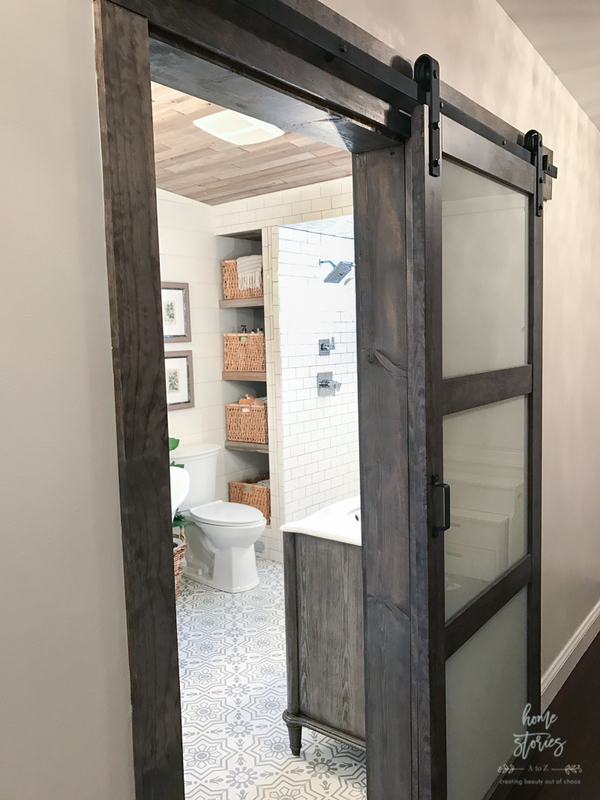 During our urban farmhouse bath remodel, I knew I wanted a modern yet rustic barn door for the entrance. 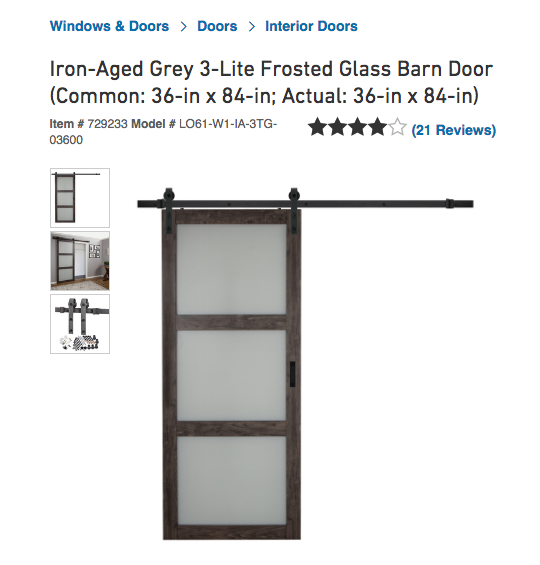 I researched several options and was thrilled to find the Iron-Aged Grey 3-Lite Frosted Glass Barn Door at Lowe’s which is priced around $299-$399. It comes with the hardware and a wood backer making it a fantastic buy. The price fluctuates depending on your location in the country and at the time I’m writing this post it doesn’t appear that you can order it online. If you’re interested in this door, your best bet is to call your store and see if the can hunt one down for you! I do recommend reading all of the comments in the review section on the webpage before installing–as we had some major install mishaps along the way! The picture below is a “good” picture of said “mishap” and was taken after about 8 hours of hard labor on my part. Knowing that my husband hates doing any kind of DIY with me, I decided to save myself some marital drama by asking my contractor to install the door for us. He glanced over the barn door packaging and hardware and said it was a simple and straightforward job that shouldn’t require more than an hour to complete. Yay! 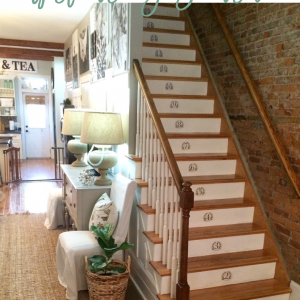 I was elated to not have to wrestle with the heavy door and hardware by myself. Unfortunately, this job wasn’t as straightforward as either of us hoped. 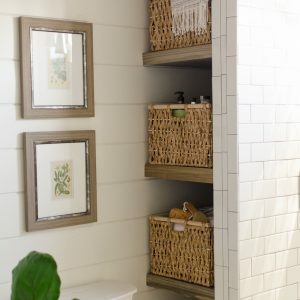 My bathroom wall is mysteriously lacking in studs and the backer board was not supported properly with the existing hardware. 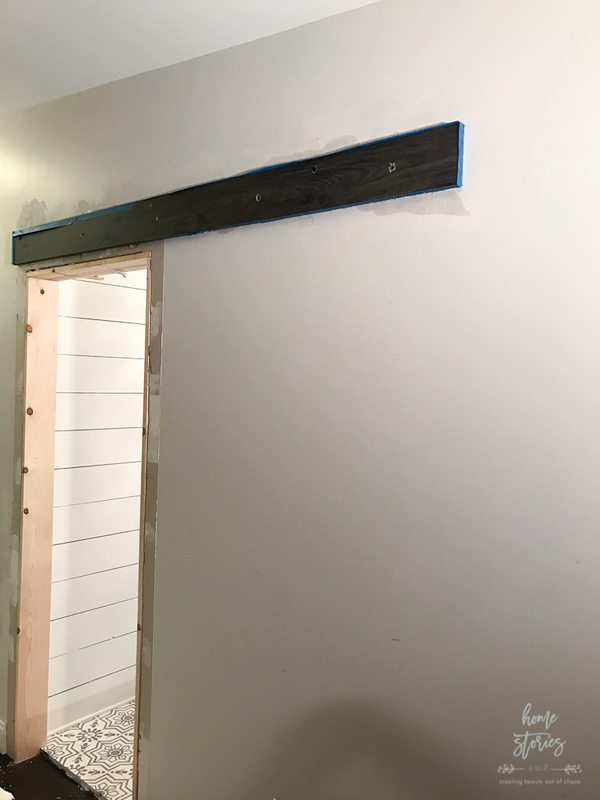 It couldn’t hold the weight of the door and had to come down–taking a ton of the drywall paper with it and the paper on the backer board. It was at this point we discovered that the door and board are not made of actual wood but rather MDF covered in wood-printed paper. I spent an entire day scrubbing liquid nails off of my wall and repairing drywall. We then tried again to make the backer board and existing hardware work, but it just wasn’t stable for my wall situation and down the board came. We finally decided to buy a real wood board and longer screws to get the job done right! The only problem I had now was to come up with the perfect stain to match the door! Lucky for me, I have the best DIY bloggers in the nation to call upon when needed. 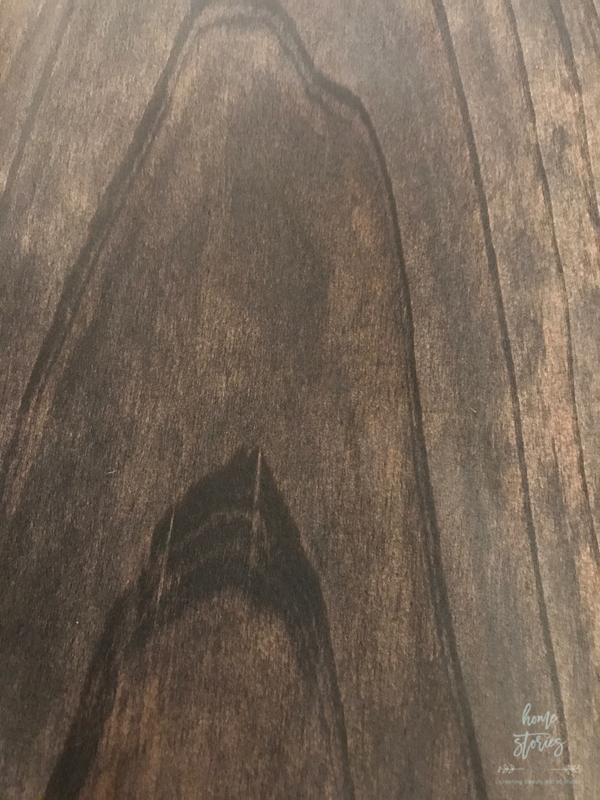  I knew from refinishing our kitchen table that I would use Minwax Classic Gray over the top of a stain to create that grayed-out color, but I wasn’t positive what basecoat color would best match the door. After weighing in with my friends, I decided to go with Minwax Jacobean followed by Minwax Classic Gray . 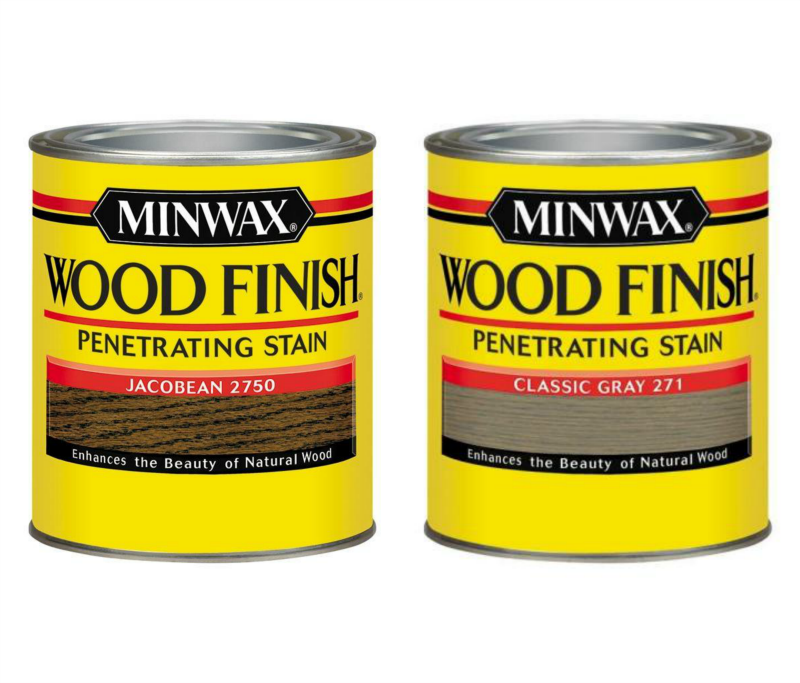 I simply brushed on a thick layer of Minwax Jacobean using a stain foam pad and left it on a few minutes before wiping it off followed immediately with Minwax Classic Gray (applied with a separate foam pad) wiped off almost immediately. This technique gave me a near-perfect color match! 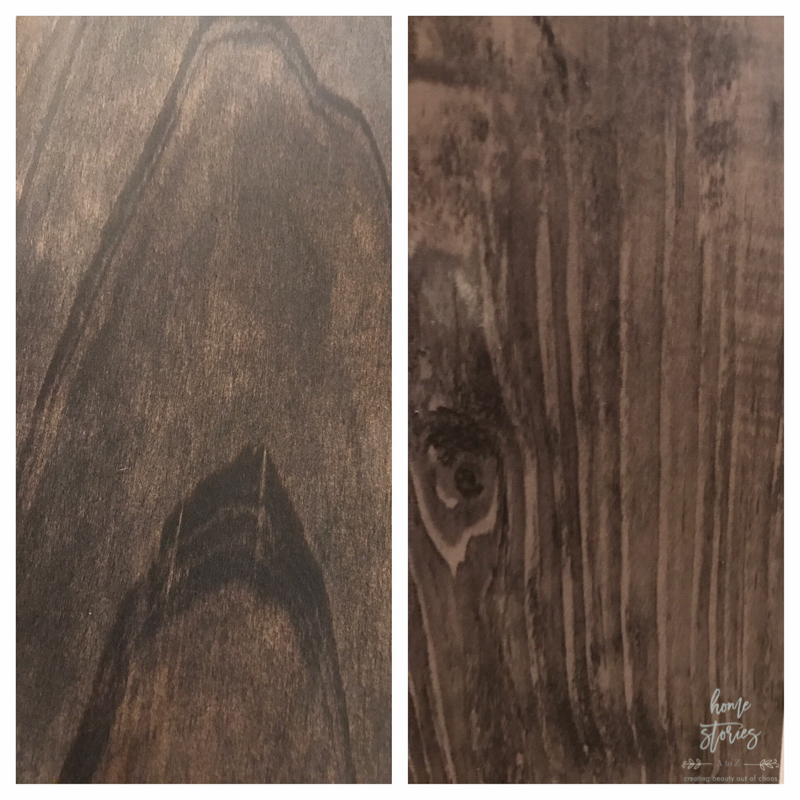 Below is a picture of my stained board on the left and the door I was matching on the right. I hadn’t originally planned to use basic 1×4 wood for my door trim but the mishaps with the door pushed our plan in a different direction and the end result is perfect! Glitches in remodeling sometimes force you to rise to the challenge to create an even better design! 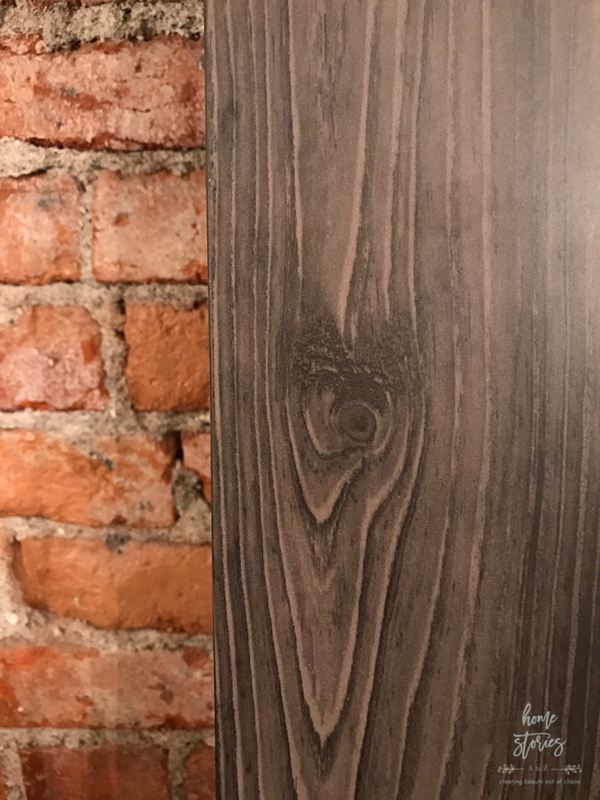 If you decide to purchase the Iron-Aged Grey 3-Lite Frosted Glass Barn Door and want to stain the surrounding wood to match you now have the secret formula! Lowe’s also carries a more clean and modern version of this door in white with chrome hardware for around the same price. 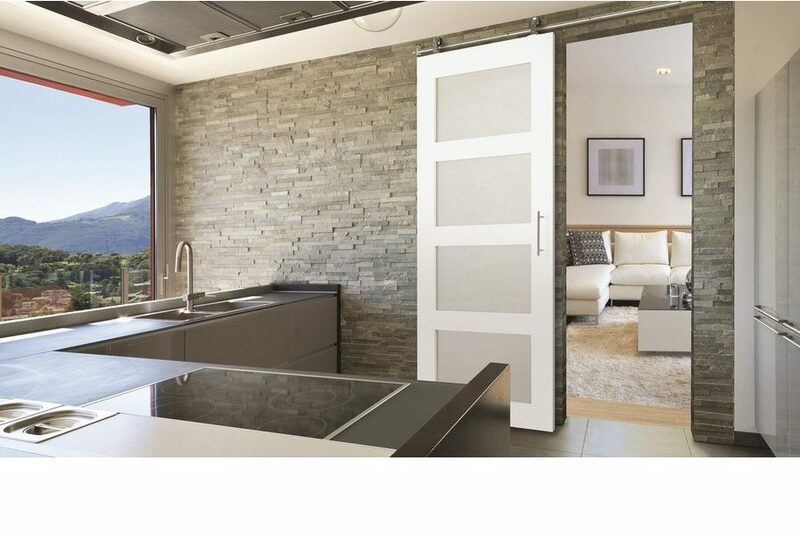 This is the Masonite Solid Core 4-Lite Frosted Glass Barn Door. 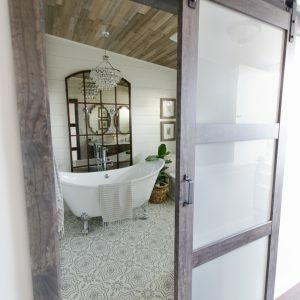 If you’re unable to find either of these doors in stock, check out the popular ReliaBilt (Unfinished) Solid Core Z-Frame Soft Close Pine Barn Interior Door. 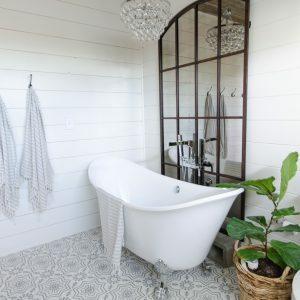 This door has a more “DIY” look to it and can be painted or stained in any color to match your decor. This is currently a popular door amongst bloggers! It also comes ready in white! 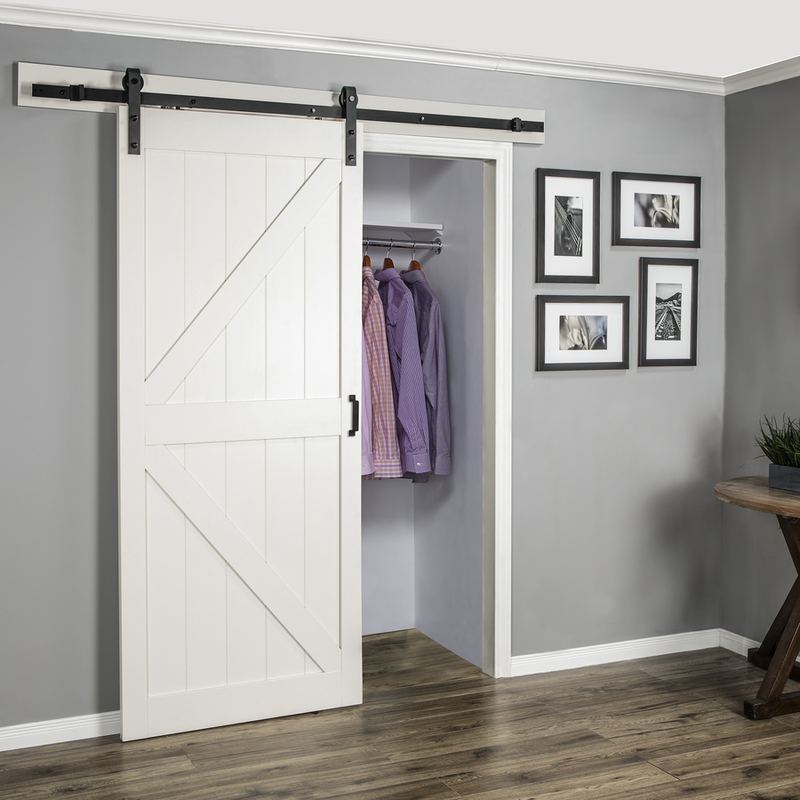 ReliaBilt Off-White K-Frame Soft Close Barn Door. 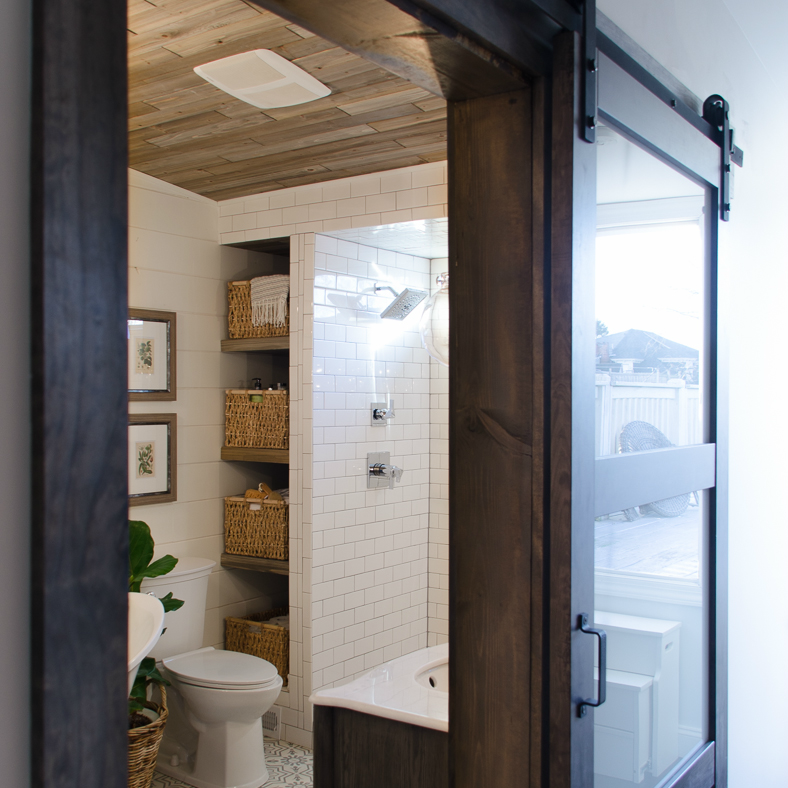 Looking for even more barn door inspiration? Check out my Pinterest board!